Jason Purifying Tea Tree Deodorant Stick is clinically tested to effectively control odour for all day protection. Naturally sourced zinc ricinoleate, corn starch and baking soda neutralise odour while tea tree oil and grapefruit seed extract, known for their antimicrobial properties, help fight odour-causing bacteria. Propanediol, Aqua (Water), Glycerin, Sodium Stearate, Zinc Ricinoleate, Polyglyceryl-3-Caprate, Melaleuca Alternifolia (Tea Tree) Leaf Oil, Citrus Grandis (Grapefruit) Seed Extract, Allantoin, Behenyl Alcohol, Ethylhexylglycerin, Glyceryl Stearate, Silica, Sodium Bicarbonate, Sucrose Cocoate, Tocopheryl Acetate, Zea Mays (Corn) Starch, Amyl Cinnamal, Benzyl Benzoate, Benzyl Salicylate, Citronellol, Isoeugenol, Fragrance (Parfum). 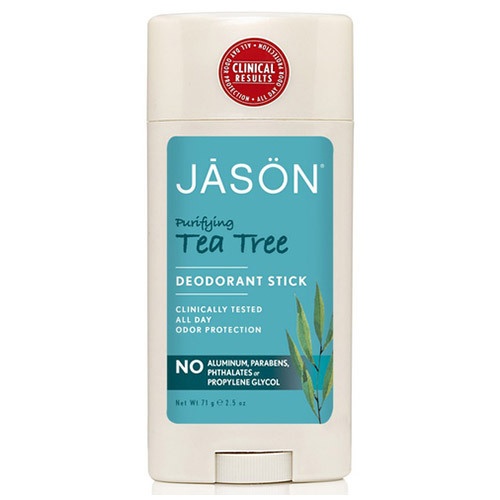 Below are reviews of Jason Purifying Tea Tree Deodorant Stick - 71g by bodykind customers. If you have tried this product we'd love to hear what you think so please leave a review.